Francisco Aquino and Shannon Norris receive their gold bars from their parents during their commissioning as second lieutenants. The mission of the Department of Military Science at Western Illinois University is: “to Commission the future officer leadership of the United States Army and motivate young people to be better citizens.” last Friday, they did just that. Four of Western’s Reserve Officer Training Corps (ROTC) cadets were commissioned as second lieutenants in The U.S. Army during the on campus ceremony surrounded by friends, family and University staff. The award-winning program has been apart of Western since 1968. Since then, the program has produced 1,082-second lieutenants. Due to the ongoing success and everlasting tradition of excellence, the military science program has won the General Douglas MacArthur Award for the best ROTC battalion in the Midwest in 1994, 2001 and 2002. Western’s ROTC Leatherneck Battalion is a member of the 3rd Brigade, housed in Great Lakes, Ill., including 22 other colleges and universities spanning from states such as Illinois, Missouri, Arkansas and Oklahoma. Of those 22 institutions, our program was named the best large program and top 15 percent school in all Cadet Command’s 272 programs in 2005. Western is a four-time winner of the Best ROTC program in the Brigade. Francisco Aquino, Kenneth A. Davis, Devin Lionberger and Shannon Norris all took the oath of office of a commissioned officer. Aquino of Waukegan, Ill., received his bachelor’s degree in law enforcement and justice administration and Spanish, commissioning as an adjutant general officer. His mother Victorina Aquino, and father, Jose Aquino, pinned on Aquino’s gold bars. 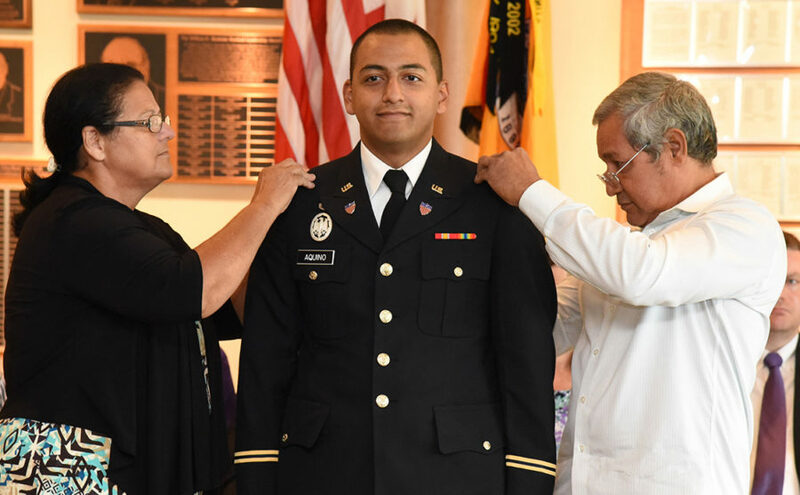 Davis of Colombia, S.C., received his bachelor’s degree in law enforcement and justice administration, commissioning into the Illinois Army National Guard and will serve as an ordinance officer. His Aunt Norma Gaddy, and father, Captain Kenneth Davis pinned on his gold bars. Lionberger of LaHarpe, Ill., received his bachelor’s degree in athletic training, commissioning into the Illinois Army National Guard and will serve as a medical services officer. Mother Tina Lionberger and father, former Army National Guard SSG Michael Lionberger pinned on his gold bars during the ceremony. Norris of Rockford, Ill. received her bachelors degree in law enforcement and justice administration, commissioning into the Army on active duty and will serve as an adjutant general officer. Parents Gerline and Carl Norris pinned on her gold bars.